For the first time in the 11+ year history of the 1906 Ultras, we decided not to bring a tifo into the derby. It was a difficult decision in light of the love we have for the Earthquakes. However, the relentless and increasing harassment we’ve been enduring for over a year from our FO has persuaded us to do the unthinkable. we attempted to compromise and send images of our tifo/message banners for review, they were rejected for arbitrary reasons though they didn’t violate any rules. we are treated like domestic terrorists when it comes to checking in our flags, drums, banners, etc. Unlike most of the groups in this league, we are not a roving sideshow of attention-seeking clowns that’s here to amuse everybody, nor are we puppets that cower and obey when the strings are pulled. We will never lower our standards and self-respect to be like them no matter how badly you want us to be. Furthermore, some fundamental principles need to be clarified. We do not do tifo to satisfy your need for advertising imagery or because you want to impress some suits who aren’t from here. 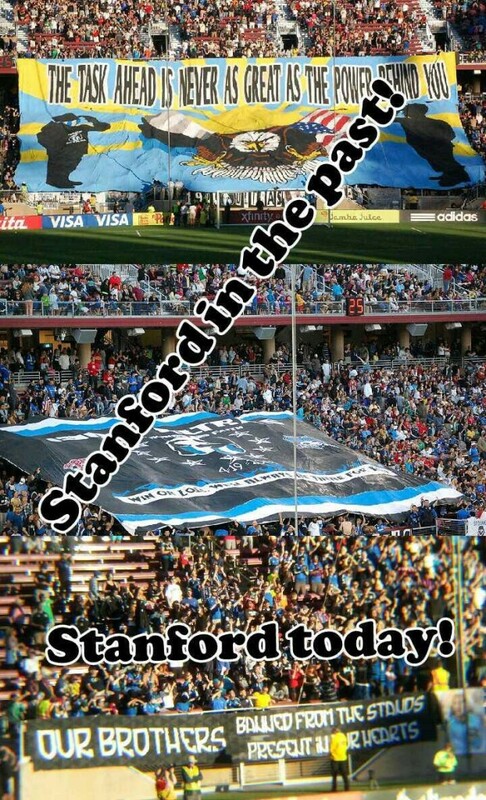 We do our tifo for the love of the team and the city of San Jose — period. If we want to do a banner honoring a player or do something inspiring for the team, we will. If we want to do a banner insulting the visiting team and their fans, we will do that, too. Maybe you’re ok with 200+ visiting fans marching into our stadium and making themselves at home, but we can assure you that we and the majority of our fellow Quakes fans are not. Ask the Quakes fans who have to sit next to the visitors’ section how they feel about it. We have never done and never will do racist or homophobic tifo nor have we ever used vulgar language in our messages. We have consistently created many memorable world-class displays over the years that have added to the rich history of the team and stand among the best that this league has ever seen, so there is absolutely no reason for this continued censorship. You are overdue for a reminder that it is a privilege for you to have us — not the other way around. We spend thousands of dollars on beer, season tickets, and merchandise; travel thousands of miles every season; spend weeks in the freezing cold and blazing heat painting banners that we pay for out of our own pockets; and make every sacrifice possible, from destroying our vocal cords to missing out on time with our families to help our team win at every single home game. The only thing that we ever ask for is to be left alone to do our thing — just like how things were for 10 years until you inexplicably declared war on us. If you want to continue to censor, harass, and threaten us, we hope you’ll be satisfied with “19740 Years of Quakes” or a tiny tarp with the old Quakes logo on it that can never seem to be held flat, because that is the alternative. If the standings are any indication, the teams needs you to focus your resources on improving conditions for them to fully utilize their talents instead of being petty tyrants to a group of loyal fans.